very sleek watch! j'adore 2 because these watches are too cool: CDB01004W and CTD0D008W. So unique and hip! will tweet, and already follow (of course)! Another great giveaway! I love CRBBB001B. It's so pretty! Love them all! But would die for the Saturation Diver, my husband is a watch person and he would drool for this one. What a great giveaway! I really love the CNRAP003W in white and pink. So pretty! What a fabulous giveaway, Erika! My favorite is the Executive Wide Calendar CEV0M001B. Have a great weekend! What a fantastic prize to win! Gorgeous. 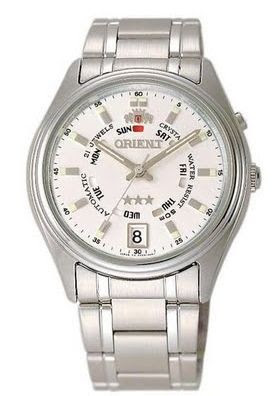 I think I an orient one too. Butbutbut I'M BACK to the blogosphere, E! Aren't you proud of me? :D I'll be commenting regularly, like a normal person now. I must say that I also am smitten with the Orient CFT00004B watch! And OBVIOUSLY I'm a follower. Oh my, I adore chunky metal watches!!!! (plus a watch is so practical :)). Sweet watch! Love the giveaway. Happy Friday Erika! Have a great weekend! That is a sleek clock. Even the name is enchanting! It looks delicate and small, but I highly doubt it'll break easily on me! PS haha close on my location! It's actually Pennsylvania! I like all the executive watches. I couldn't pick just one! I love the CDB01003T watch! thanks god for dual-citizenship and spilt parents for addresses. I'm in love with Circle Face Semi Skeleton. I really like the CFD0C001M! Oh my gosh, what an AMAZING giveaway!!! You continually impress me with what you make possible for your readers. I can't decided which one I like best, but I've narrowed it down to two: CNRAP003T and CBFAQ001W with the white face. my favorite piece would be the CFA05001B - 2010 Worldtime. I'm a follower as well!! what a great giveaway. i like lady rose CRBBJ002W. i this one is very pretty and i love the color. i am a follower. i love the CEXOPOO3W with the white face - it's clean looking & i love the leather band! My favorite is the Lady Rose CRBBA001W. My favorite is the Lady Rose CRBBA001W. Simple and cute! i'm a follower :) & i also tweeted. I really like - Lady Rose, CRBBB001B. It's so classy and says - Upper East Side. I love the whole lady rose collection! Wowzas! Great giveaway! I so need a watch! The Orient site has so many beautiful options to choose from! I like the Lady Rose collection (specifically the third one down in the left column. my phone won't let me copy and paste boo!). I like the Ladies » CETAE003W Multi-Eyes because it is just the right size and the red leather band looks gorgeous. I'm already following you via Google Friend Connect, Google Reader, Twitter. I've fallen in love with the Sporty Watch CVZ02001B (black face) This would be awesome for summer, when I need something durable! And I follow through google reader! I love CRBAU002B, it is sleek and elegant, but I think it could be worn with just jeans and a tshirt as well. Man, I'd love an automatic watch! Amazing. My favorite is the CNRAP003W because it's ladylike and reminds me of spring. I'm already a follower. Thanks! Because it's boyish and would really make a super girly and feminine outfit dressed down a bit! I'm also a new follower of Cafe Fashionista on Google Reader and my favorite watch is the CEM5J005W please please please! It looks boyish while still looking so refined and beautiful! Also tweeted about this giveaway! My fav is the CEM5J005W !!! I like the CDB02002H, semi skeleton. I'm following via GFC.. I like the CDB02002H because of it's sporty look, with the red semi-skeleton face and the black leather strap. (1).